Put your video on the web in three clicks with Flix Standard! 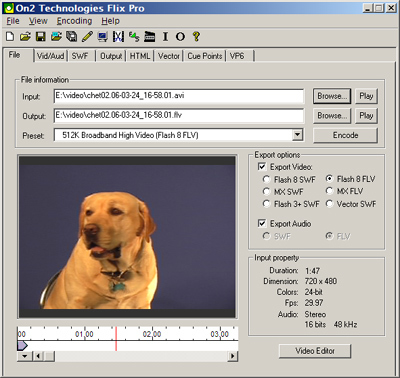 Flix Standard encodes virtually every type of video, audio and image file into Flash, the most popular media format on the Internet. An amazing value, Flix Standard is the perfect entry-level video encoding solution. On2 Flix Pro offers professional-quality output and an amazing array of time-saving features including the ability to automatically output cool Flash players for your video. Create video for the web, video blogs, CD-ROMs, presentations, and limitless other uses!